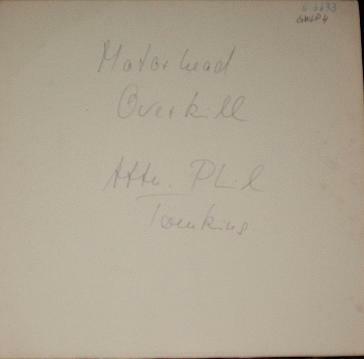 The test pressing of the GWLP 4 does not seem to be that common. The first time I heard of a copy was in October 2006 when a copy was listed on Ebay. It has the same labels as the test pressing of Orgasmatron which is logical because it was also made in Germany by RCA/Ariola. The labels are white with black printing that says "Unverkaufliche Musterplatte". The copy that was listed on Ebay had the matrix number B 6633 written in ink on the label and came in a white, polythene lined inner sleeve and a plain white card outer. The matrix number is also on the card sleeve along with the catalogue number in the top right corner. It also had Motorhead and Overkill written on the front in the middle and two bits I can't make sense of written in ink. The copy in October 2006 was sold for £185 on Ebay. It was sold by Brian Tawn.